Alaskan king crabs star on the menu at Tracy's King Crab Shack, Juneau. It’s rare that an eatery claiming to have ‘the best in town’ lives up to its hype. But Tracy’s King Crab Shack may just be the exception, discovers Jocelyn Pride. When you stand in a queue to eat from a tin bucket you want the food to be worth it. Especially when the restaurant is an open-air shack in a place where fleeces are standard wear. Claiming to serve ‘the best legs in town’, a plastic chair at Tracy’s King Crab Shack is one of the hottest seats in Alaska. After following a mud map drawn by a couple of local bikies we met along the only main road in Alaska’s state capital of Juneau, we finally find Tracy’s. Squeezed next to a multi-storey car park and overshadowed by several massive cruise ships, it’s easy to miss. I’m initially underwhelmed. There’s no view, no loo and the T-shirts hanging from the bar say, ‘Tracy gave me crabs’. Not one for tourist traps, I’m tempted to walk away. But the sweet aroma of the ‘legs’ bubbling in large pots lures us into the queue. It’s lunchtime, so the wait is long. Many customers are from cruise ships and it strikes me as madness to give up an already-paid-for-lunch on board a floating hotel to eat at a food truck. But I soon understand the reason for this decision. Owner Tracy LaBarge is an example of the old adage, ‘do one thing and do it well’. Crab is the only choice on a menu that hasn’t changed since she started the business in 2006. Varieties of crab include snow, king and, if in season, local dungeness. I opt for the Crab Shack Combo that includes a 250ml serve of crab bisque, four crab cakes and one king crab leg. The menu says it serves one to two people, but there will be no sharing; my husband orders his own combo. The bisque is thick, warm and inviting. Velvety smooth with chunks of crab, it slides down easily. Reluctant to eat the accompanying garlic bread for fear of running out of stomach space, I can’t resist for long and soon find myself dunking and slurping along with everyone else. The crab cakes, golden brown on the outside and buttery soft on the inside, come with Tracy’s own hint-of-fire seafood dipping sauce. As we prepare for the pièce de résistance king crab leg, there’s a drum roll of clicking cameras. 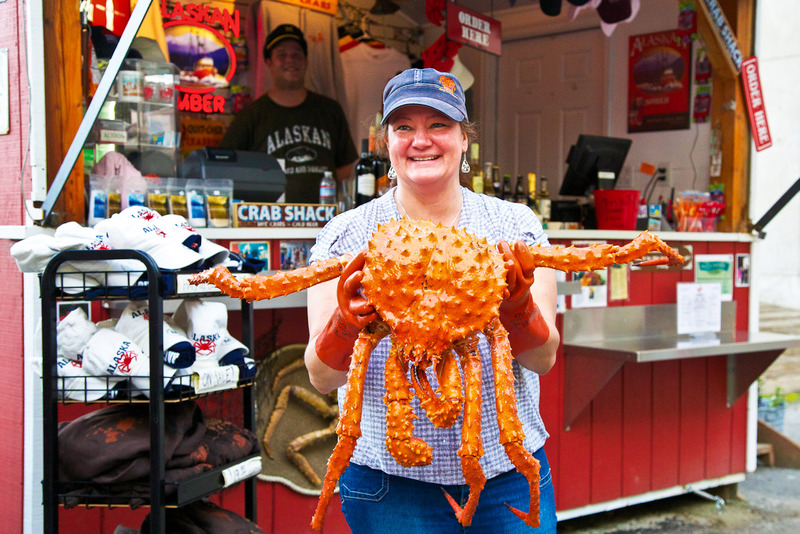 Tracy is posing with the daddy of all king crabs and giving a run down on crabbing. Crabbing in Alaska is big business, but having been named by Discovery Channel’s Deadliest Catch as ‘the most dangerous job in the world’, it’s not for the faint hearted. By the time our bucket arrives with two enormous spiky looking red king legs sticking out the top, I’m practically drooling. Fortunately Tracy makes eating crab a no-fuss affair: there’s a split down one side of the leg and the plump snow white flesh falls away from the shell. I dip a chunk into a pot of drawn (melted) butter, the traditional way to enhance the sweetness of the crab. It’s a match that transcends food into an art form. I don’t want to swallow; I don’t want there to be a last mouthful. Everyone else looks like they feel the same way. Our shared tables create a global picnic where snippets of different languages blend into a mutual feeding frenzy. Nobody notices or cares about butter dribbling down chins, the cracking of shells nor the smack of lips as the last morsels are sucked from legs. Although the service is quick, nothing feels rushed. As we leave (and no I didn’t buy a T-shirt), I’m surprised the afternoon has evaporated. Looking at my watch I wonder if it’s too greedy to contemplate coming back for dinner. My husband reads my mind. The food quality is exceptional. A meal at Tracy’s is enough reason to visit Juneau when travelling to Alaska. Open every day 10.30am-8pm from May until September. No reservations are taken. Jocelyn paid $100 including taxes for two Crab Shack Combos and two glasses of Alaskan beer.